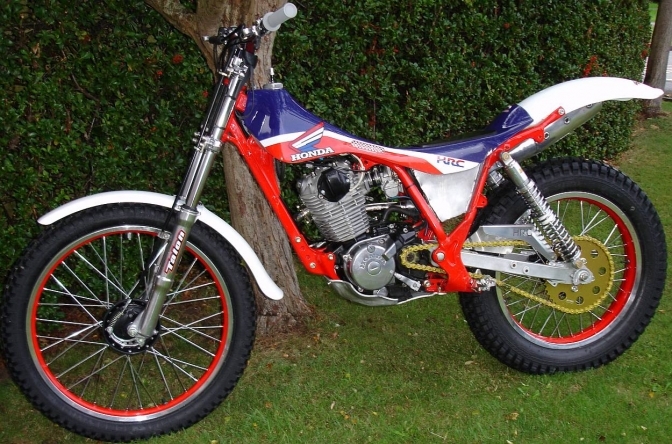 The Honda TLR trials Bike. This is the second of the Interactive pages where you can join in and give us your Knowledge of the breed if you wish? and also comment on the modifications stated , and add your opinion what to do to make the TLR Honda Tick. Don't be shy we are all in the game for the same reason, to get the best out of our machines and more than that have fun. 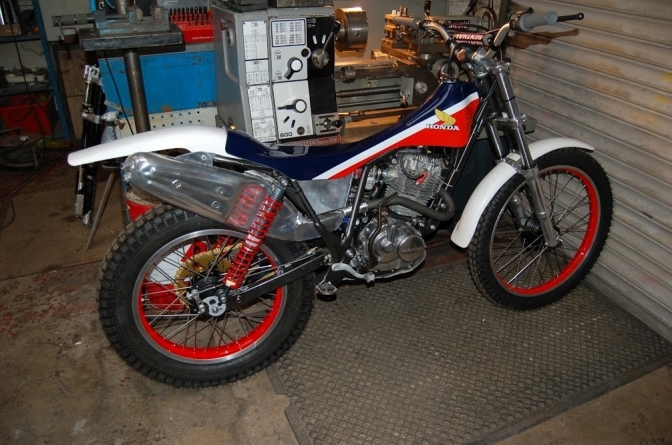 And don't forget the TLR was never a factory designed trials machine. The TLR Honda's in 2017 remain one of the most popular twin-shock machines. Good parts availability, and gentle easily manageable power delivery makes them a sensible choice for many riders. 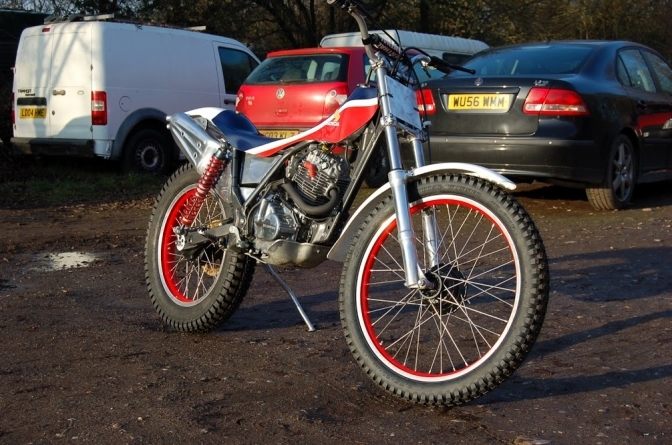 However in common with other Japanese trials bikes these are machines which can be improved significantly by carefully carried out alterations and modifications. 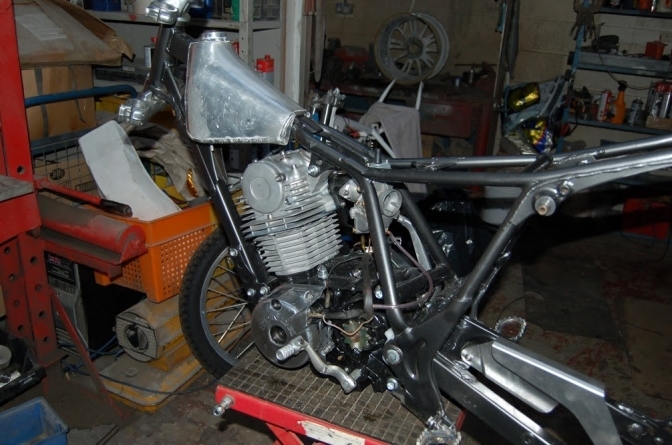 Classictrial have been carrying out alterations to the TLR now for about 15 years, and changes to the footrest position and steering angle were one of the first modifications that were made. These changes proved so effective that 100s of frames have now been modified, and this is the first step in converting a TLR into a far more serious and competitive machine. Hampshire rider Matt Sleep is perhaps the most successful TLR rider of recent years, coming second in the 2012 Sammy Miller series, and winning the series in 2013 and 2014, but more recently being sidelined due to problems with his knee. The alterations detailed here are pretty much what has been carried out on Matt's TLR200 motor, and mean 1st, 2nd and 3rd gears can be used in the sections. Carrying out the modifications detailed here will substantially increase the rear wheel power of a stock TLR (approx 8bhp), but its worth bearing in mind though that all the changes carried out together will make the bikes much more of a handful for novice competitors, who might find improving steering and suspension is a better idea. Firstly the motor to be modified needs to be in good mechanical condition with NO play in the cam drive side bearing, and no problems with kick-start ratchet slipping or jumping. If there are issues with either of these things they have to be rectified properly to avoid future possibly very costly problems. Any one of the modifications explained here will improve performance, but the maximum gains are only possible when all of the changes have been carried out. 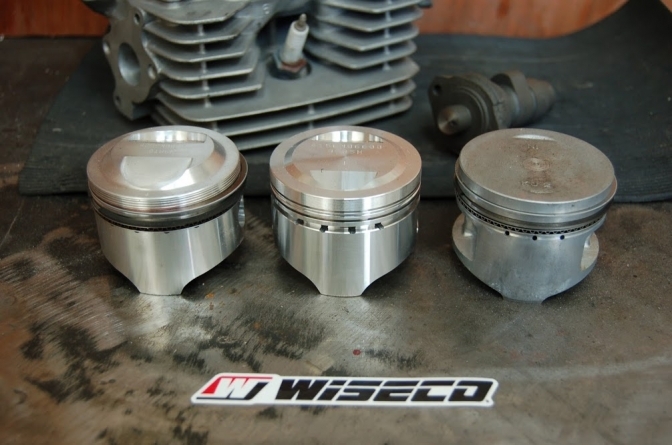 Increasing the compression ratio by fitting a Wiseco piston is the first thing to do, especially if spreading the cost over a period of time is helpful. For some riders the improvement from higher compression (increased torque, smoother running at low speeds), may be all that's required, and this modification is ideal for club-man riders competing in easier events. Ports on the TLR head are poorly finished, very often with large steps between the port itself and the valve throat area. Its a good idea to blend the port into the valve throat, and this will improve low speed running, and help reduce the tendency to spit back and stall. Ultimate cylinder head on TLR involves reshaping the inlet port for better low rpm gas flow, and fitting a larger inlet valve seat with a bigger valve. Ultimate camshaft for TLR trials bike is something with slightly more duration, but substantially increased lift. Failing that, cams intended for XR200 work better than stock and fit the TLR motor after minor alteration has been made. Head from ATC200x will fit the TLR, and has more fin area and bigger valves, and is a good idea if stock head is badly worn. TLR OE exhaust system is heavy, restrictive, and not great to look at. The various after-market systems are much lighter and less restrictive, but all seem to be of relatively low volume, and while slightly better than OE in performance terms, will not work anywhere near as well as the large volume HRC system that was fitted to the RTL. Having made systems along the same lines as the RTL one, but designed to fit the TLR, this is something that really does work very well and needs to be considered by anyone wanting the very best possible performance from their bike. Slightly longer RTL type front pipes increase torque slightly, but dont seem to be commercially available. Stock air box on the TLR is like the exhaust quite restrictive, and this is due to the flame trap gauze which the foam air filter sock mounts onto. This is relatively easy to overcome by removing the stock filter, fitting a mounting stub into the intake hose, which will accept a foam pod filter. Stock carbs are often past their best, and Sheng Wey pattern replacements work well, or for the ultimate motor TM24 Mikuni, custom intake manifold, and alloy air box. The alterations outlined here will if properly carried out, result in a TLR with plenty of power for better riders in harder events, and mods such as increasing the compression will improve bikes being used in club events significantly. There is a lot more to come on this page about the Honda TLR. so Please join in and throw us your four pen-eth worth. More Later, and don't forget ,if you don't comment, don't knock the advice given. You know these machines run Very Well Indeed. and more still, are Winners. "If you want the Best you have to Beat the Rest". when they got back to Britain and decided that it would be a good excuse to try and re-jig the old XL Honda we have had for years, that was gently decaying in one of the sheds. So I promptly dumped the mutilated TLR frame onto my work bench at the workshop. and but it back into a better condition than it ever had been in. and don't forget I had done the steering head modification a year or two ago. My brother promptly said he would spray the frame for me as he had just done a bloody good job spraying the Mini-Otter Number four frame for me as he felt guilty not getting the OC and Mini-Otter three frame back from the powder coater for me before Christmas, not his fault but a man that did not pick his sports car chassis up from the powder coaters after they had given him priority over every thing else. So I promptly instigated the stripping down of the Honda XL 185 bike and dumped the engine into the blasting cabinet after Brian made some blanking plates for exhaust and carb inlet and outlet. I had both wheels lined up from the aborted first pit-bike engine build along with the Gas-Gas Forks that I as going to fit then. The ClassicTrial tank-seat cover was dumped in Lee's spray both ready for the HRC red white and blue colour scheme, to be performed on it . He said it would be a change from the top class steel MeteorWorks steel frames he usually sprays in the booth. So the plot was gathering momentum the only thing that was souring the situation was the very perforated Honda TLR swinging arm that I had previously tried to bronze weld up the rot on it. Brother said If I was doing that he would make a "Proper" jig one that as true and not like the ones I was using. 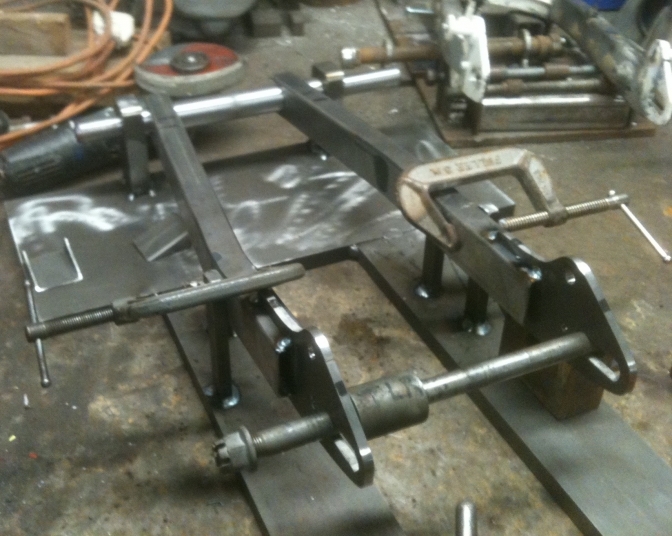 I had to explain that the Harry Foster swinging arm jig had 43 , now 44 swinging arms mad on that. And I had made ten or more Otter arms on my own jig, but there was no changing his mind, I am building it he said and went off for a load of expensive machine tooling steel. So there we are today, with more done on the project than ever I had even thought about. 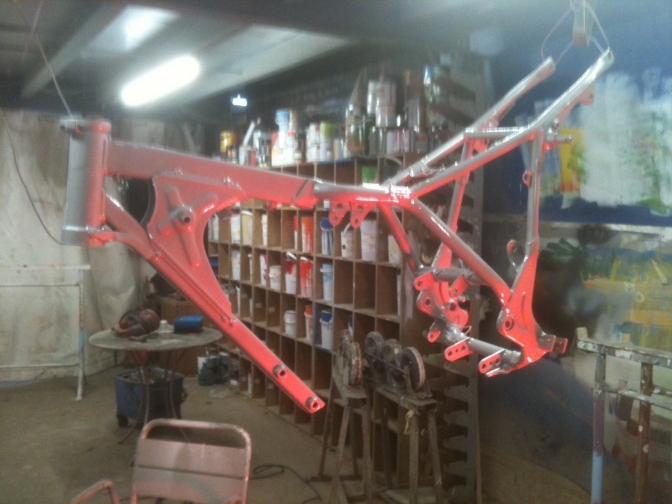 Frame now re-jigged and painted metallic Grey. 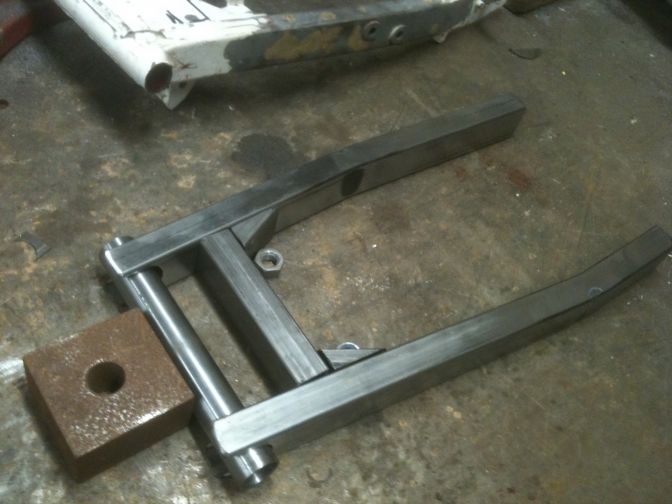 New Swinging arm parts assembled, ready for jig. More progress with the project over the past couple of days, the rest of the parts for the swinging arm jig have been made, and today the eleventh, I tacked the New arm together. The New exhaust system and bars should be here tomorrow. and I have fitted the Suzuki front wheel into the Gas-Gas forks. More photos and update later.